GrandArt Coatings franchise business opportunity. Free GrandArt Coatings business franchise information. 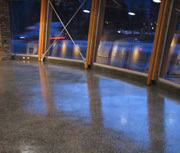 In addition, the product can be utilized on exterior floors or walls. The end result is a finish that has the look of granite, stone, or, if desired, customized to include a unique design or feature. The application is a process utilizing sprayers & other equipment adapted and modified specifically for achieving the desired look. In addition, varieties of techniques have been developed and are employed to provide the texture, sheen, and color combination specified. Garage and Basement floors as well as patios, walkways and stairs can be made to look like granite or stone thereby adding an attractive feature enhancing the value of the property. Showroom floors at retail premises, office, and warehouse space can be designed to include company logos or a particular scheme to enhance image. The product(s) can be applied over new or existing surfaces. Existing floor finishes, such as tile, can be coated thereby eliminating the associated cost. The application process is fast and the surface is ready for use within hours. The design, color, or texture can be changed or altered to suit, at any time. To learn more about the GrandArt Coatings franchise consultation services, simply complete the form below.